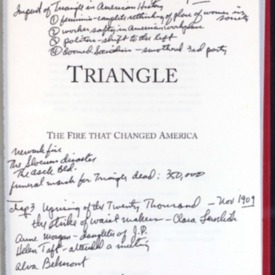 Triangle : the fire that changed America · One Book. One Author. One Hour. Half-title page and title page contain notes on the date and time of the fire, the high number of dead - most of them women -, the ethnic background of the Triangle Waist Co. workers, the outrage caused by the fire among New Yorkers, the impact of the fire on the political machinery in New York City and on American history in general - 1) a rethinking of the place of women in society, 2) concern for worker safety in the American workplace, 3) a shift in politics to the left, 4) dooming socialism to failure. Also included in the notes is a comparison with the 9/11 attacks when workers jumped out of windows to their deaths, the names of some of the workers in the factory, of some activists pushing for reforms, and of some factory owners. Notes on p. 316 refer to the subsequent trial and the acquittal of the factory owners. -- Annotations by Brian Lamb in the margins and underlining of pertinent phrases throughout the book. Von Drehle, Dave, “Triangle : the fire that changed America,” One Book. One Author. One Hour., accessed April 19, 2019, http://booknotes.gmu.edu/items/show/624. Describes the 1911 fire that destroyed the Triangle Shirtwaist factory in New York's Greenwich Village, the deaths of 146 workers in the fire, and the implications of the catastrophe for twentieth-century politics and labor relations. "Fires--New York (State)--New York--History--20th century." "Clothing factories--New York (State)--New York--Safety measures--History--20th century." "Labor laws and legislation--New York (State)--New York--History--20th century."